Home Jollibee Jollibee Ube Pie Ube The Jollibee Ube Pie you’re craving for is back, for a limited time! The Jollibee Ube Pie you’re craving for is back, for a limited time! Missing Jollibee's UBE PIE already? The instant hit dessert that made waves on social media and various sites is back and ready for your taste buds. Jollibee’s Ube Pie is back this November, and for a limited time only. Ube is part of Filipino's rich food culture and often seen in desserts, such as Ice Cream, Cakes and pastries, served during special occasion, or "pasalubong" (souvenir/gift) when a family comes home from a trip or arrived for a visit. 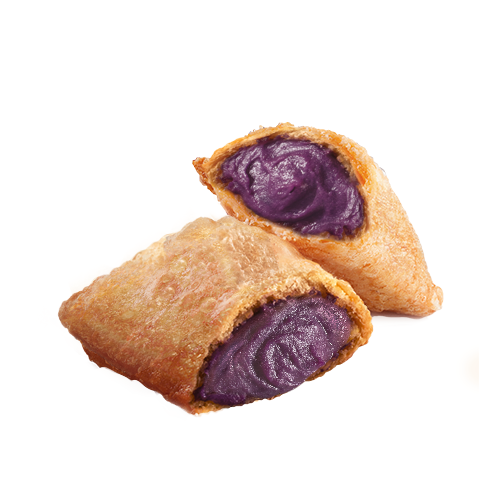 Now, Ube/ Purple Yam is now part of Jollibee's famous crispylicious Pies and is back for a limited time. When we launched the Jollibee Ube Pie last May, the sales and the demand was so great. It was so well loved that we knew we just had to bring it back for our customers...We wanted to bring back the joy to all the ube-lovers and to allow those who have yet to try this delicious dessert to join in on the delight. Ube, or purple yam, has been featured by no less than GQ magazine and Huffpost as the dessert flavor that’s about to rock the international scene. Its sweet taste and all-natural intense purple color is both unique and instantly enticing. Best of all, it’s healthy. Of course Filipinos don’t need to be reminded of just how mouthwatering ube is—that’s why we’re always craving for it! Whether it’s to finish of a yummy meal or just a sweet snack to tide you over, the Jollibee Ube Pie will satisfy your appetite. Drop by your favorite Jollibee store for the return of the Ube Pie! Your favorite Ube Pie is now available in all Jollibee stores nationwide for dine-in, take-out, drive-thru, or delivery. The Ube Pie retails for P29 for a Solo Pack and P82 for a Trio Pack.